DENVER (AP) The Los Angeles Dodgers secured home-field advantage throughout the playoffs Saturday by beating Colorado 5-3 on a night when the Rockies clinched their first postseason appearance since 2009. It was also the Dodgers’ 103rd win of the season, the most since the team moved to Los Angeles. At 103-58, they’re assured of the best record in baseball. Healing from a sore knee, Chris Taylor drove in the go-ahead run with a ground out in the seventh after reliever Tyler Chatwood (8-15) hit both Yasiel Puig and Chase Utley to start the inning. Puig finished 2 for 2 with a homer, walk and four runs. Carlos Gonzalez hit a solo homer off Clayton Kershaw for the Rockies, who officially wrapped up the second NL wild-card spot when St. Louis rallied to beat Milwaukee earlier in the day. Gonzalez is the only player remaining from the last time the Rockies were in the playoffs. Colorado will be making its fourth trip to the postseason. The Rockies travel to Arizona to face the Diamondbacks on Wednesday, and the winner will meet Los Angeles in Game 1 of an NL Division Series on Friday at Dodger Stadium – with a rested Kershaw waiting. Dodgers reliever Brandon Morrow (6-0) picked up the win. On his 30th birthday, Kenley Jansen got the final four outs to earn his 41st save. The first pitch was pushed back Saturday by 21 minutes for what was called a weather delay. Only, no rain fell and the tarp was never unrolled. The Rockies didn’t mind. They were busy celebrating in their clubhouse after watching the Cardinals record the final out. After that, they sprayed soda. After the Rockies jumped out to a 3-1 lead on Kershaw, Puig tied it in the fifth with a two-run homer. Rockies righty German Marquez gave up three runs over six innings and struck out two. He leads all major league rookies with 147 strikeouts and remains tied with teammate Kyle Freeland for wins with 11. Kershaw’s last impression for NL Cy Young Award voters went like this: four innings, three runs, seven hits and two strikeouts. He and Max Scherzer of Washington are the front-runners for the award – Scherzer left his start Saturday with what the team called a hamstring cramp. 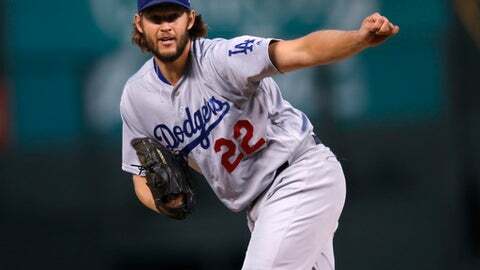 The left-handed Kershaw finished the regular season with an 18-4 mark and a 2.31 ERA. Kershaw has surrendered a career-high 23 homers this season. That matches his total for the previous two seasons combined. Dodgers right-hander Yu Darvish threw 40 pitches in a bullpen session. That’s pretty much as close as he’s come to pitching at the hitter friendly park over his career. Darvish could possibly face Colorado in Denver during the postseason. Rockies manager Bud Black pulled most of his regulars by the middle innings. … OF Charlie Blackmon had his 68th multihit game of the season with a pair of singles. Dodgers: The final game of the regular season will be a start by committee, with right-handed reliever Ross Stripling likely beginning things off. ”It’s not set in stone,” Roberts said. Rockies: LHP Tyler Anderson (6-6, 4.81 ERA) is 3-1 with a 1.19 ERA since his return from knee surgery.